Waste of time. Doesn't do ****. Of course it smokes, it's burning the Seafoam. Are you saying seafoaming does nothing? so I shouldn't waste my time with it? Not trying to sound "smart," Just trying to save time and money. Hello all this is my first post here. I am not too familiar with this website so I don't know if this is the best place to ask this question, but here it goes. This is the results of a compression test I did on my 2004 Rx8 that I recently purchased a couple months ago. It only has 48,000 original miles. 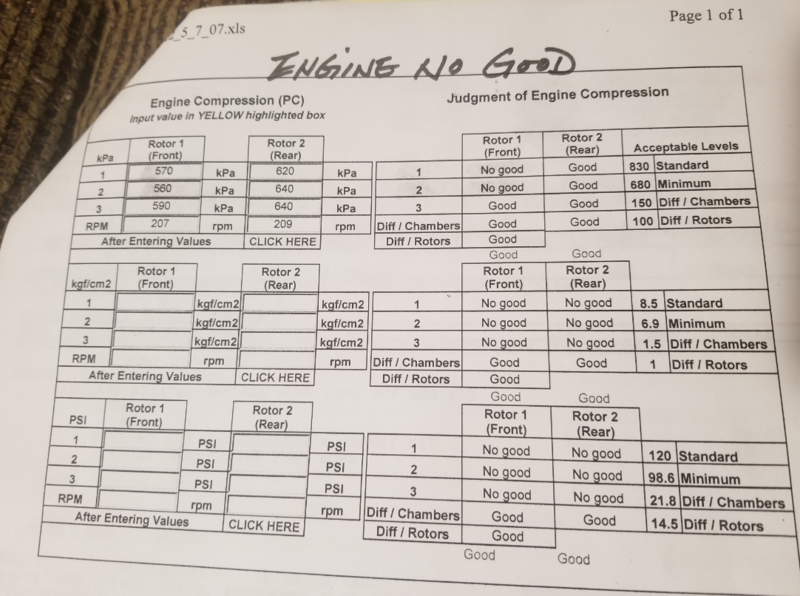 I was wondering if anyone thinks the Sea Foam treatment is worth trying to improve these numbers or if the engine will just be failing soon. If the engine will be failing soon does anyone know a ballpark as to how soon? 5k 10k miles? Thank you in advance! It only costs an hour of your time and $10 to try. If it does help, it's still only a temporary solution, so plan for a rebuild. As for how long it will last, there is not telling, but what you'll experience is more and more difficulty starting the engine when it's warm. Not tragic just annoying at first. So you have time to plan for a rebuild. 2006 621 mile or 2009 12k mile- which one i should buy? Jet Air & OMP Idle "Whine"